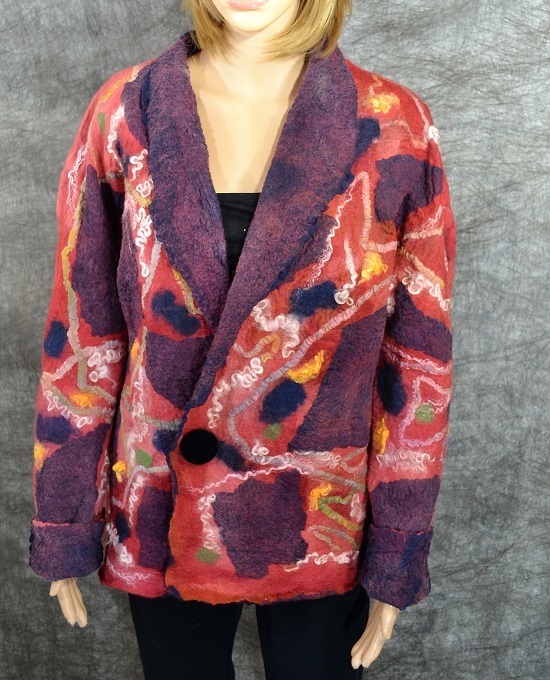 This wool silk blazer, coat, was made of Australian merino wool and silk chiffon. I made it with Nuno felted technique. 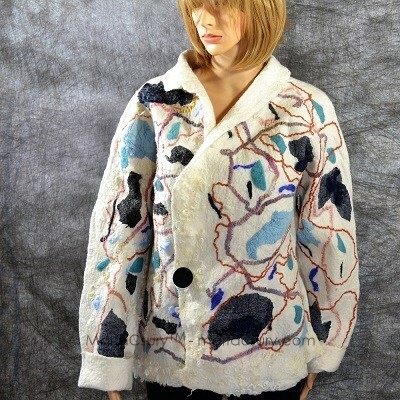 I used silk fabric and wool. I work with the natural material and use water and soap. All design is one of a kind completely handmade in a smoke-free environment. The material is extra fine Austral Merino wool. It’s embellished wool yarns Tees-water lock and wool yarn. 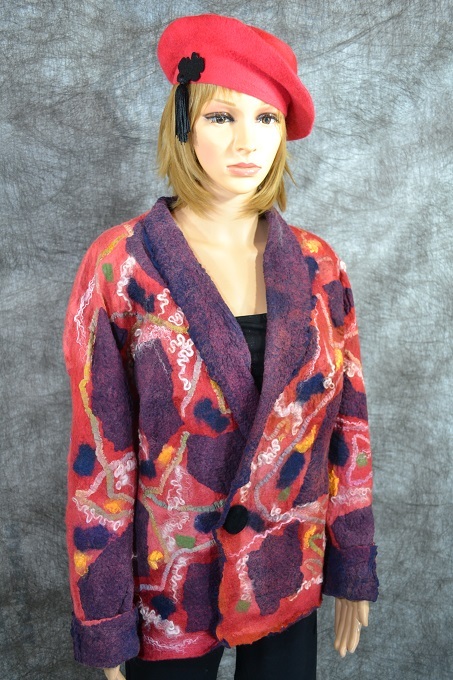 A made a red beret which fits this coat, but it doesn’t include them.REVERSIBLE. 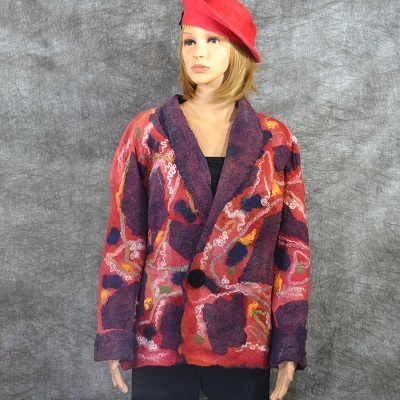 Felt red mosaic jacket, silk wool, handmade warm jacket for a woman. I recommend wearing in three seasons. The wool is warm and in white is organic and elegant. as elegant, classy, or pure fun. your time to view my selection. Material: Australian merino wool, wool yarn, Tees water lock and silk gauze. The wool roving comes from Germany in very high quality. Easy to care. 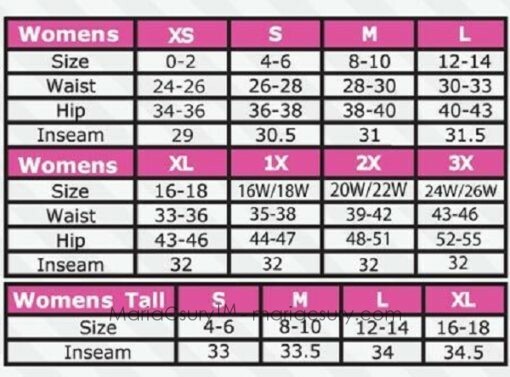 For better result and long lasting quality of the garment; hand wash uses cold water and hair shampoo. Roll in a towel, squeeze out the water. Iron while slightly damp on the wrong side at silk setting. Reshape, lay flat to dry. Don’t use tumble dry. Don’t iron. 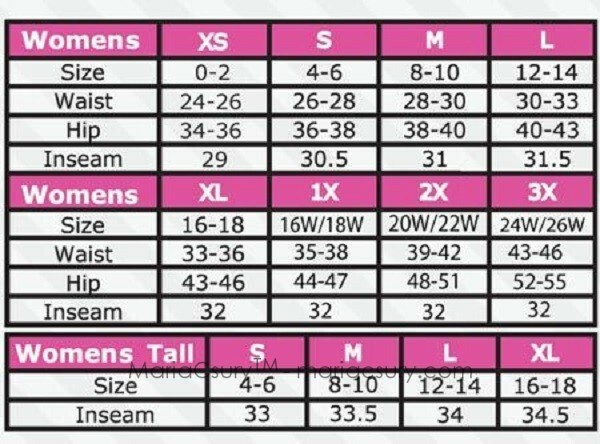 Size, S-M usually one jacket fits two sizes. The closing is a brooch which looks like a button. It is adjustable.